Fans Have A Chance To Be In Star Wars: Episode VII! In 1940 Disney released it’s second animated film Pinocchio. This little puppet was brought to life by the Blue Fairy after Geppetto wished on a star. However, before Pinocchio can be changed to a real boy, he must be brave, loyal, and honest. With the help of Jiminy Cricket, Pinocchio begins his adventures. 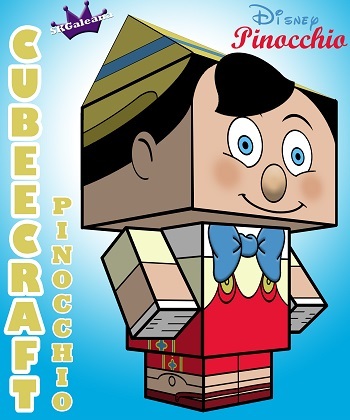 After I received a request to make a Pinocchio Cubeecraft, my adventure began. With such an iconic character, I had to be sure that even at a glance, fans would be able to recognize this character in cubeecraft form. There were two things that needed to be considered. 1. Pinocchio has a long nose even before he lies. I had to decide it I wanted the nose to actually protrude from the face or be drawn on the face. 2. This character has a weird shaped hat that needed to be attached to Pinocchio’s head. After making several templates of the face, I chose to draw the nose on the cubeecraft. This decision not only makes it look a little cleaner but also makes the formation of the cubeecraft a little easier. After both choices were completed, I was able to finish this request and create a quick look. To download the cubeecraft simply click the image, right click and select save image as.